Last time I dropped by (“Oh, is it dinner time? Who knew? 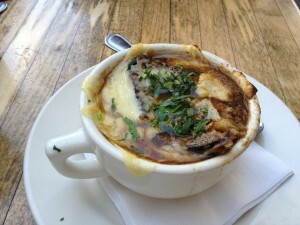 What’s cookin’?”) Suzanne offered me a sample of her French onion soup. While my memory is admittedly badly impaired, I don’t recall eating a better version of it, ever. For those of you who do not want to go to Encino because you are too busy visiting more glamorous places like, say, Cleveland, I have managed to procure the recipe for Suzanne’s soup. If you know what’s good for you, you will make it. up to 25 minutes; be patient and let them caramelize fully or the rich flavor of the soup will be compromised. Pour in the wine, cognac, and chicken stock, add the bouquet garni and simmer for 30 minutes. 4. Set 8 oven-proof ramekins or soup bowls atop a sheet pan. Remove the herbs, add salt and pepper to taste, then ladle the soup into individual bowls. Place the baguette slices on top of the soup in each bowl, submerging it slightly to moisten. Sprinkle the toasts with gruyere and bake in the oven for 15 minutes, then set under a hot broiler to brown the cheese topping. Note: If increasing this recipe or if using a medium-sized pot, saute the onions in batches so as not to steam them. Steaming will prevent the onions from caramelizing and result in a weak broth. 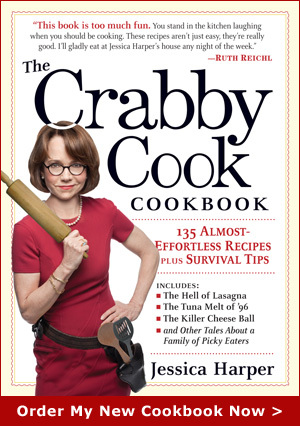 This entry was posted on Tuesday, April 3rd, 2012 at 12:34 pm	and is filed under Soup 'n Sandwich. You can follow any responses to this entry through the RSS 2.0 feed. You can leave a response, or trackback from your own site. I am hoping to stop by Paris in the next few months to replenish my Encino-Meets-Paree repertoire! Oh and I still cannot believe that I was in Paris in 2003 for 8 days, tres magnifique! Can’t wait to go back! Mmmm, thanks for the recipe. I was just thinking of trying to make a French onion soup the other day… Yay! Hey– enough with the Cleveland jokes! It’s a wonderful place to live. Great smart people, beautiful seasons and a vibrant city on the rise with biotech, healthcare, startup innovators, new casino, waterfront, fabulous restaurants, world class orchestra and art museum. At any rate, THIS ONION SOUP recipe is fabulous. If you happen to have some beef marrow bones to brown before the onions go in, it adds a divine depth of flavor. Dr. D should give you a free cleaning for giving him such a good recommendation!